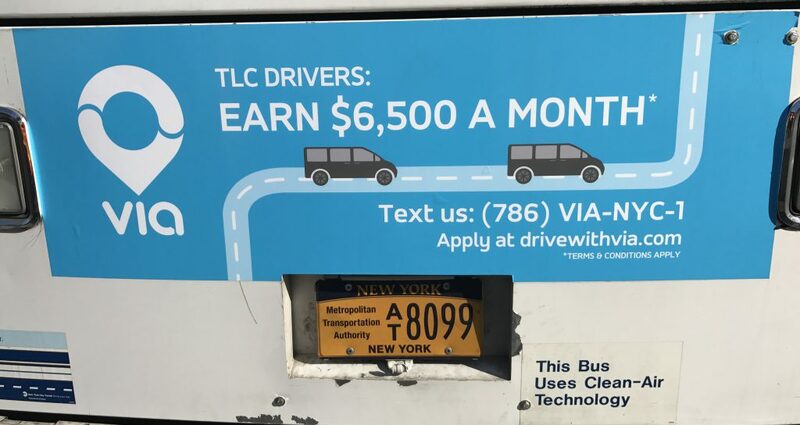 About a year ago, I noticed that there was a battle for taxi drivers. 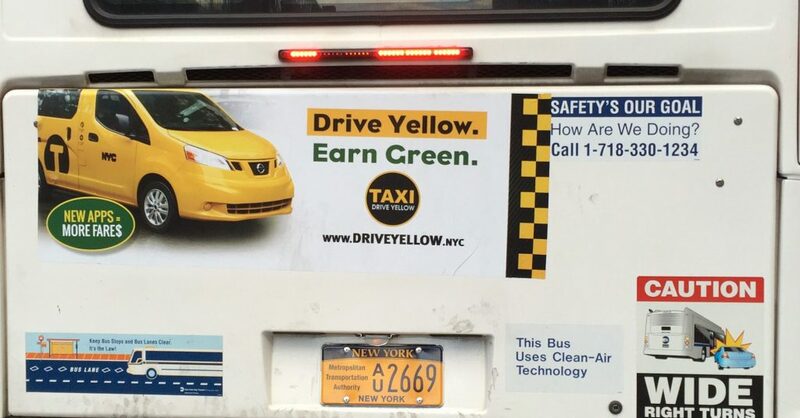 The “yellow” industry posted this “Drive Yellow, Earn Green” ad on the back of a NYCT bus in an attempt to attract drivers. I then noticed that the whole taxi industry is using this space. 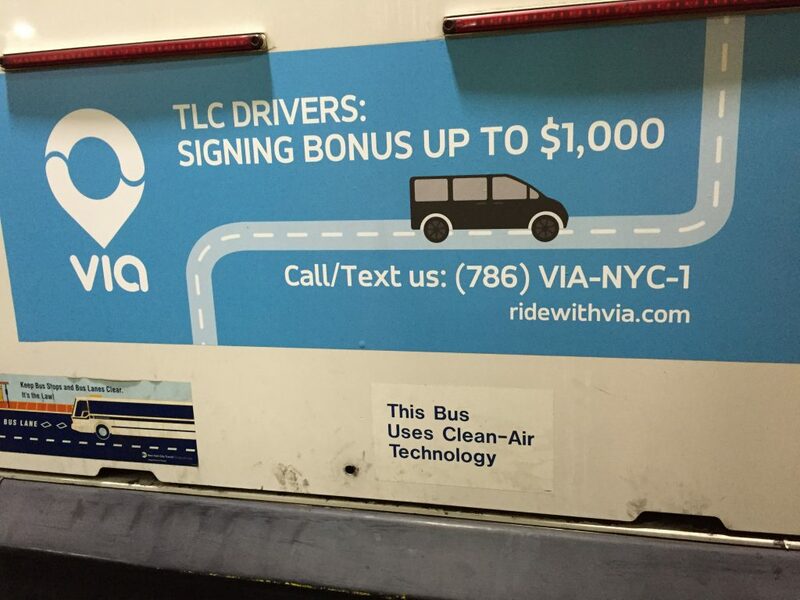 Here are the ads I’ve seen… I find it comical that one form of transit is advertising on the back of their competition. 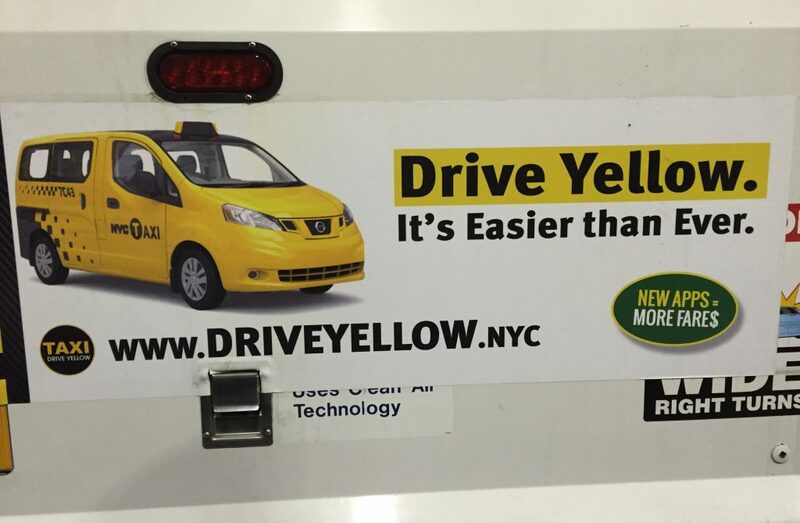 Drive Yellow, It’s Easier than Ever. Isn’t that racist? 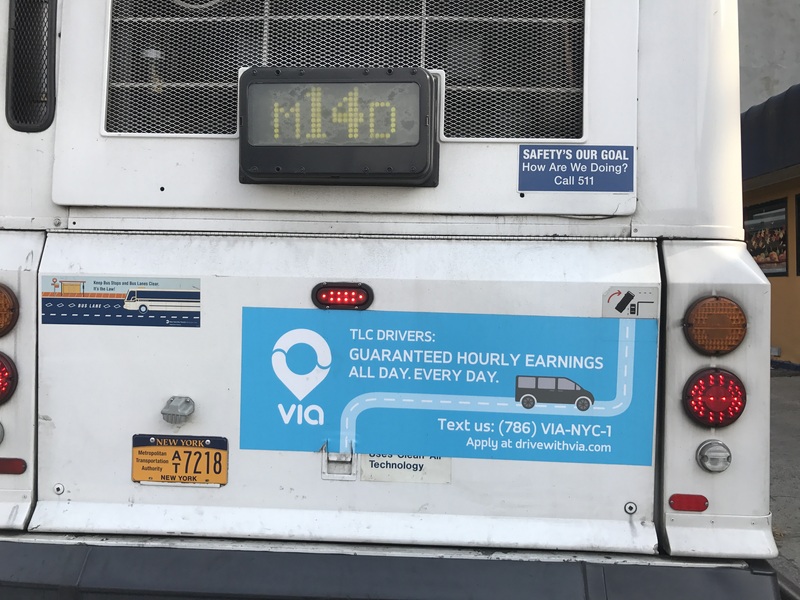 14,000 is a big number! 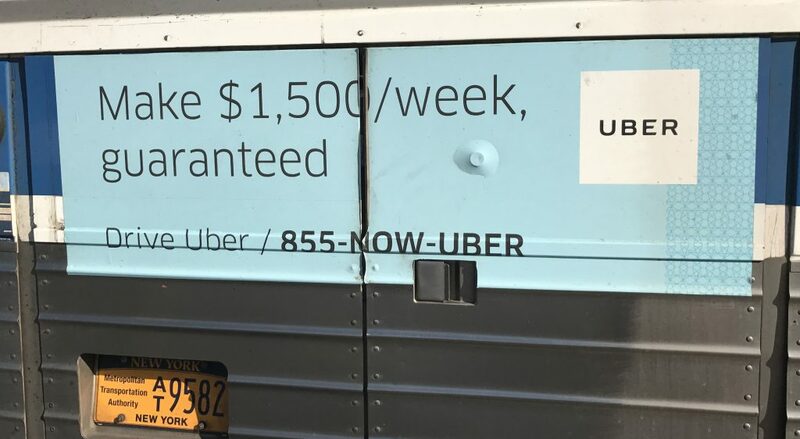 Wait is there some fine print? 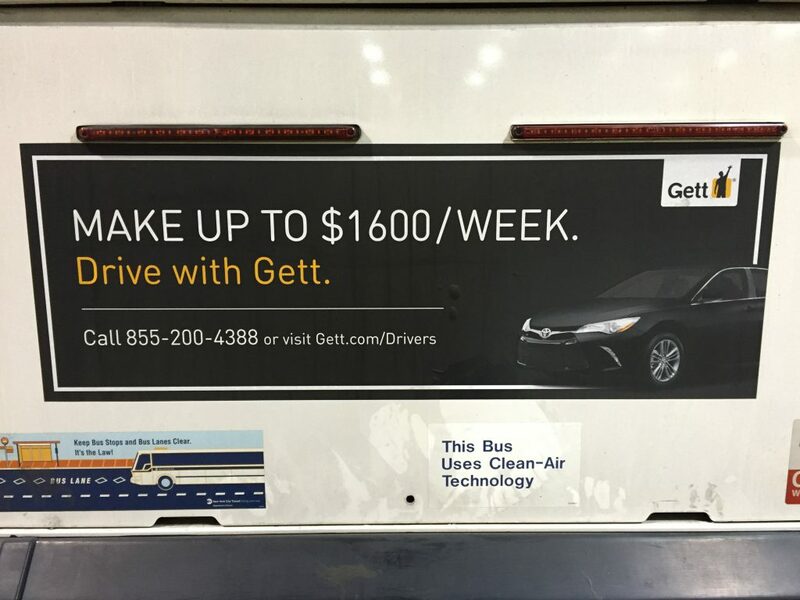 1600 is less than 14000 but it’s weekly! I gett it! Let’s not talk about money. 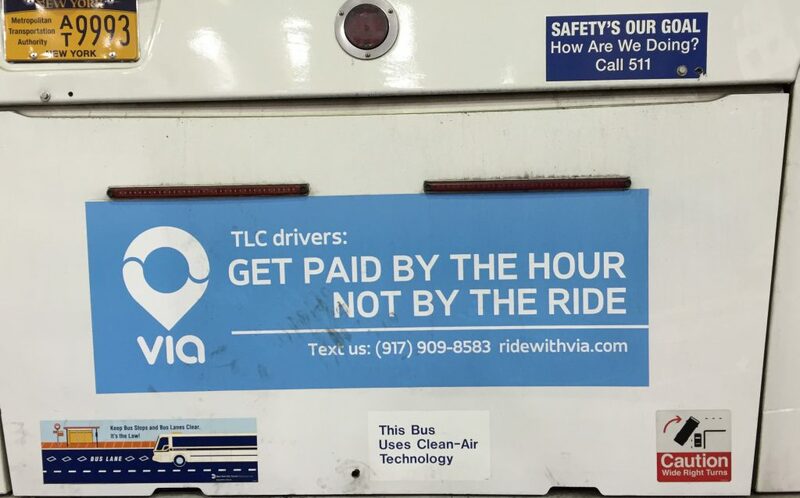 You pay us, and drive. No need to speak English anymore! 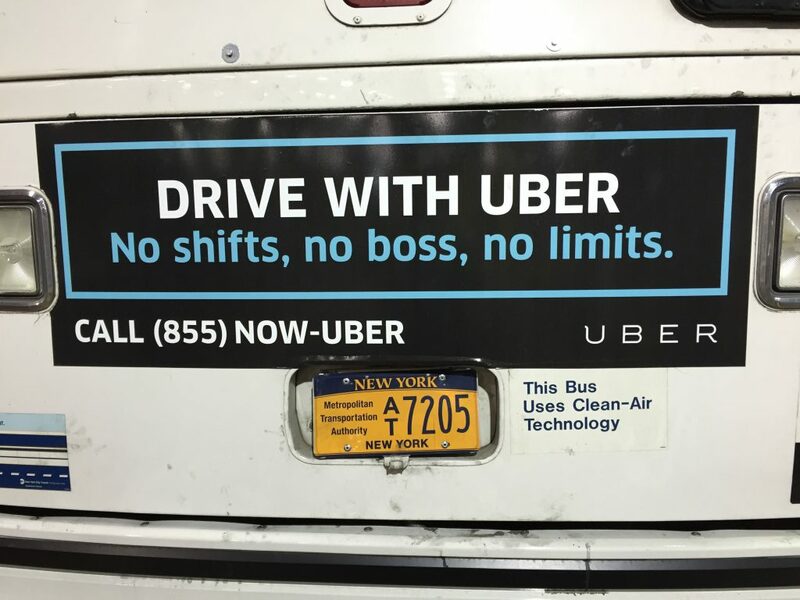 Unemployment has no shifts, no boss and no limits also! 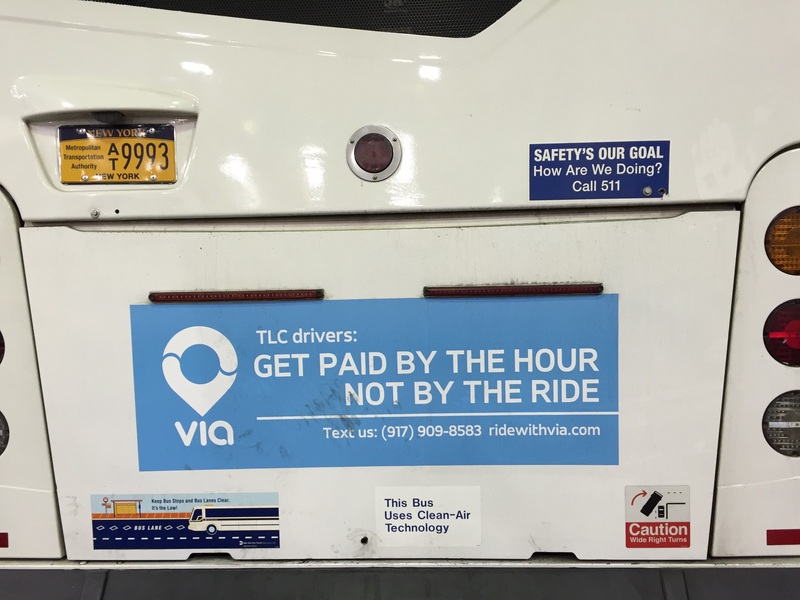 Hey, maybe if we keep the same slogan and change the color, we can attract new drivers. 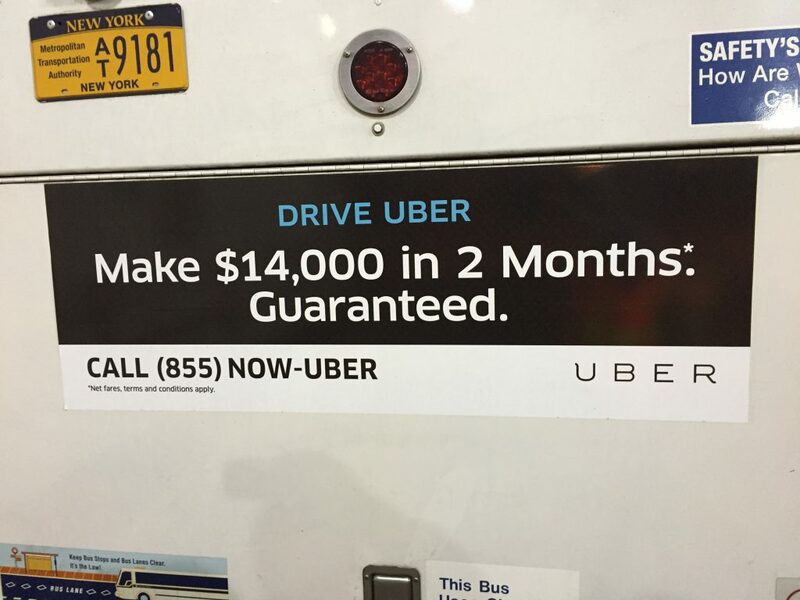 I liked the 14000 guarantee better. 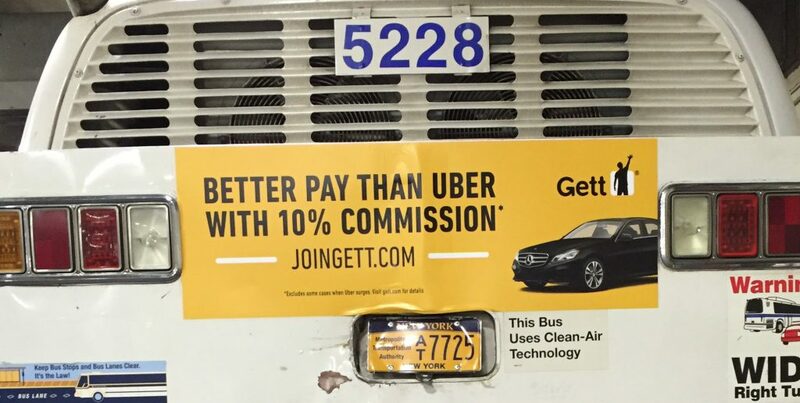 Is a 10% commission a good or bad thing? 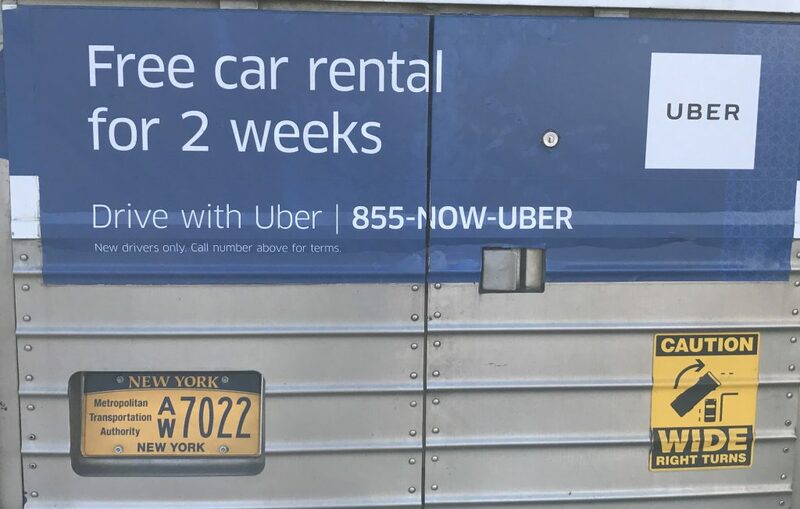 Free Cars! 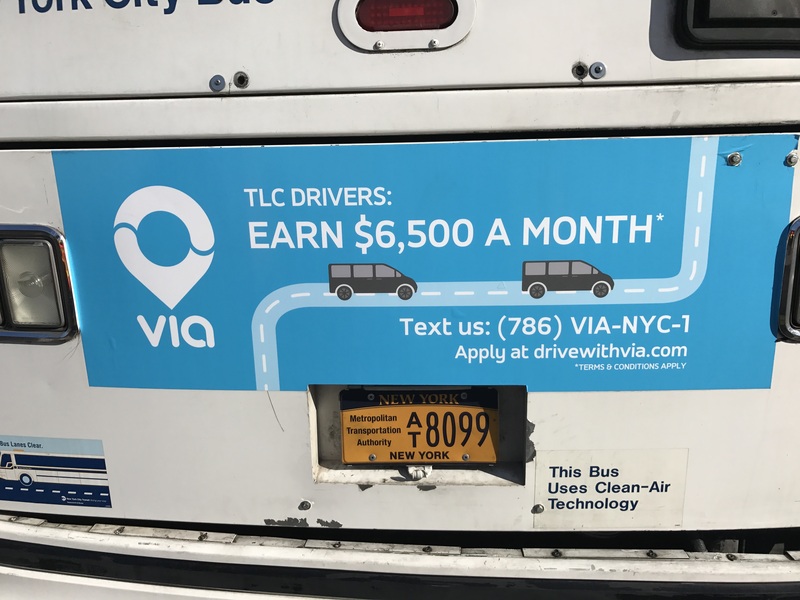 Where do I sign? 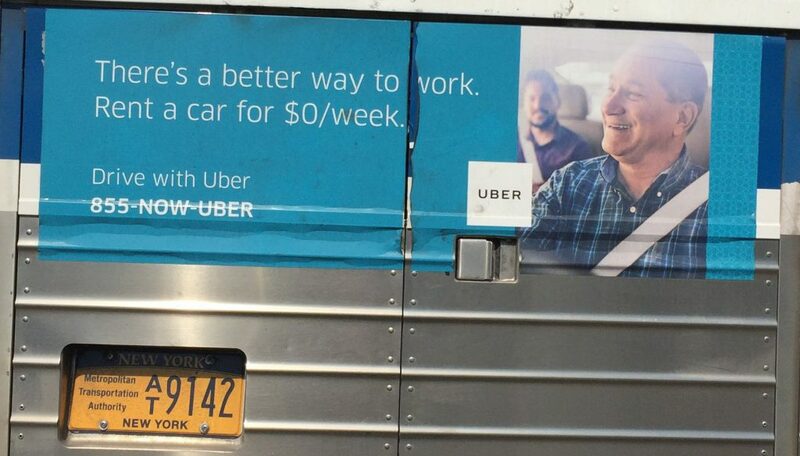 What happened to the happy white guys in the last ad? Maybe they are not happy anymore. Only 1000, but I the other guy had bigger numbers! 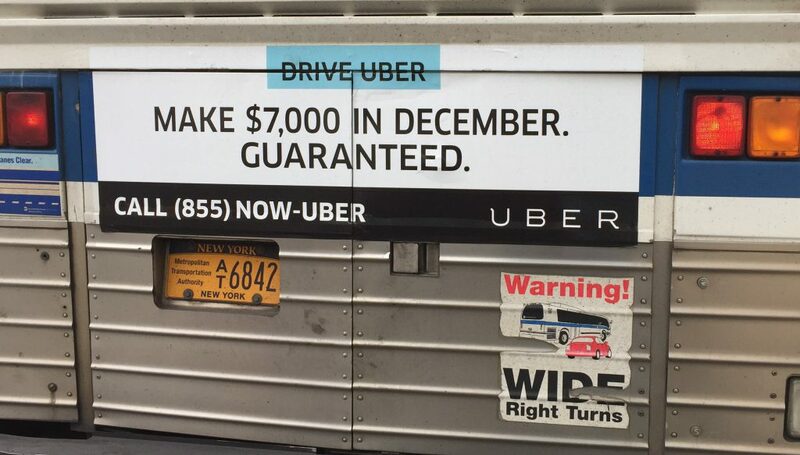 What is the guarantee? 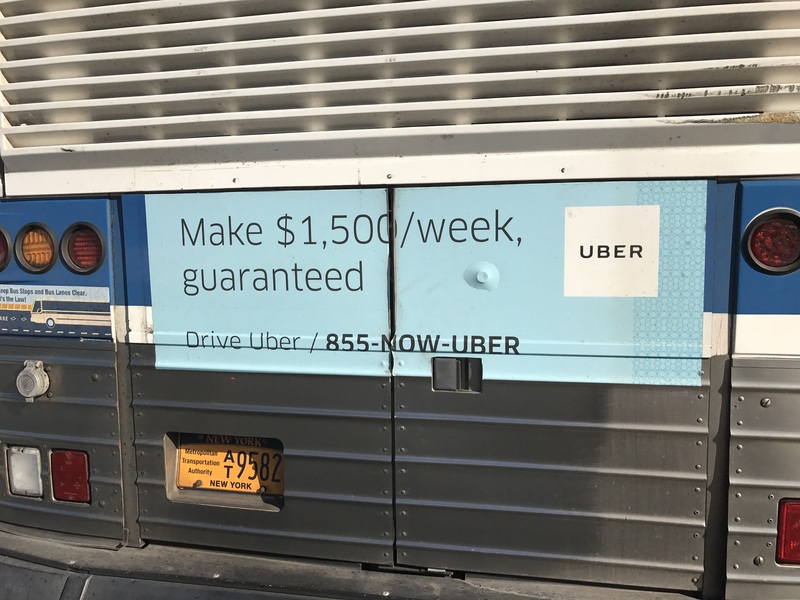 $10/hr? 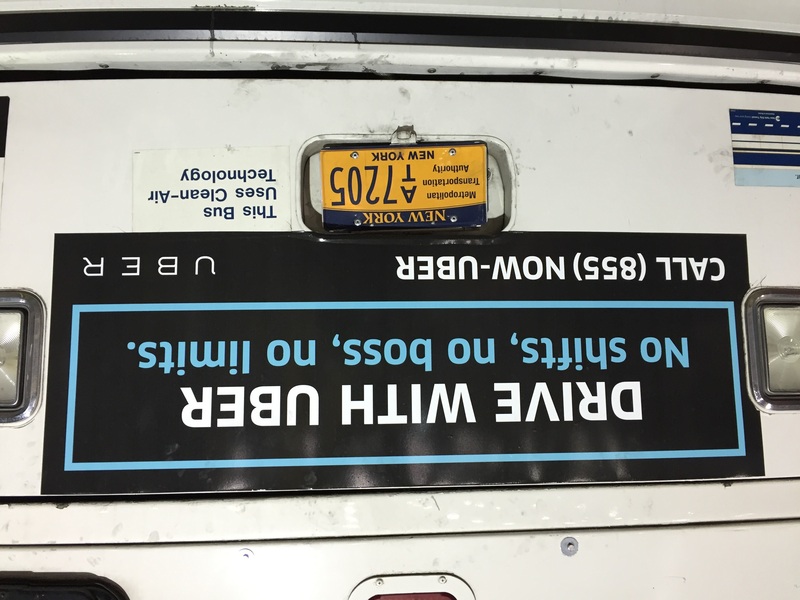 I’m guessing this battle will continue until the driverless car is introduced. 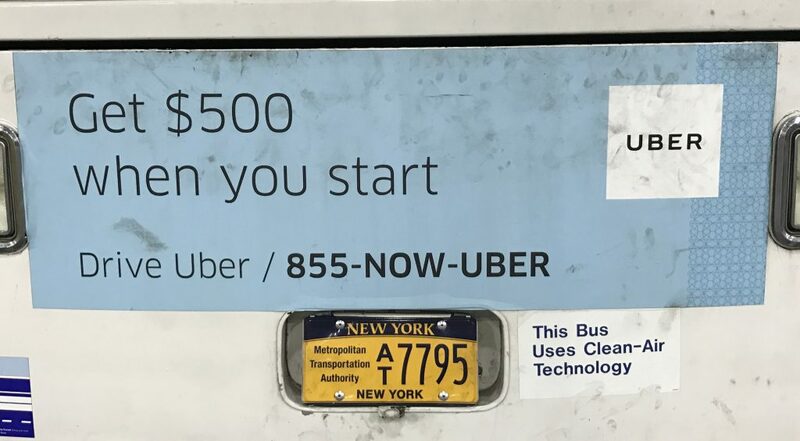 $500 Now…where do I sign? 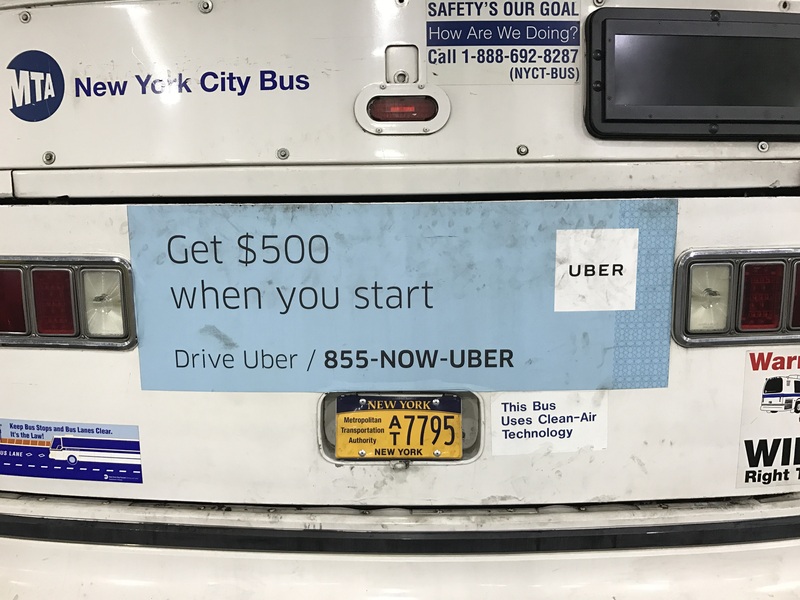 Can I get the $6,500 plus the $500 sign up bonus from Uber? 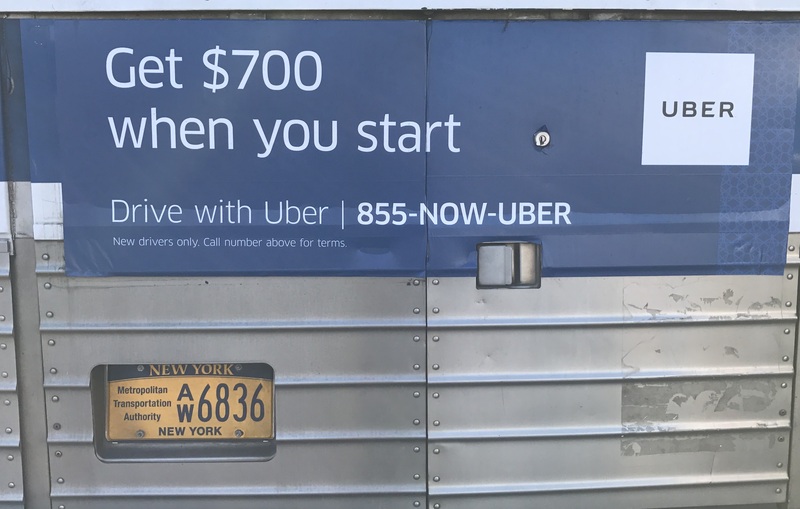 $700 When I start? How much when I finish? 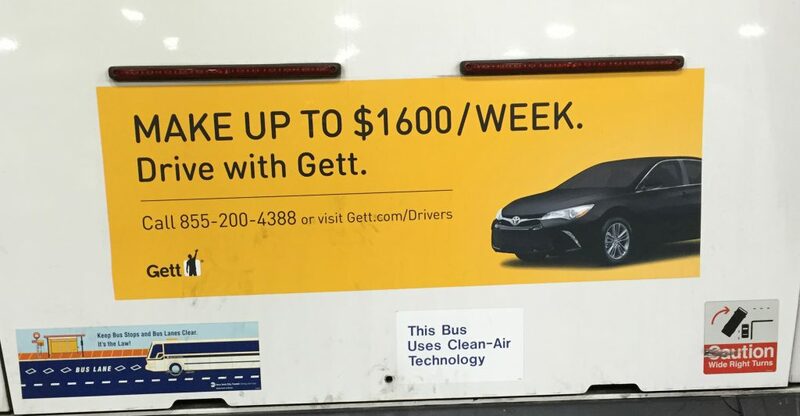 Can I get the $700 and a free car? 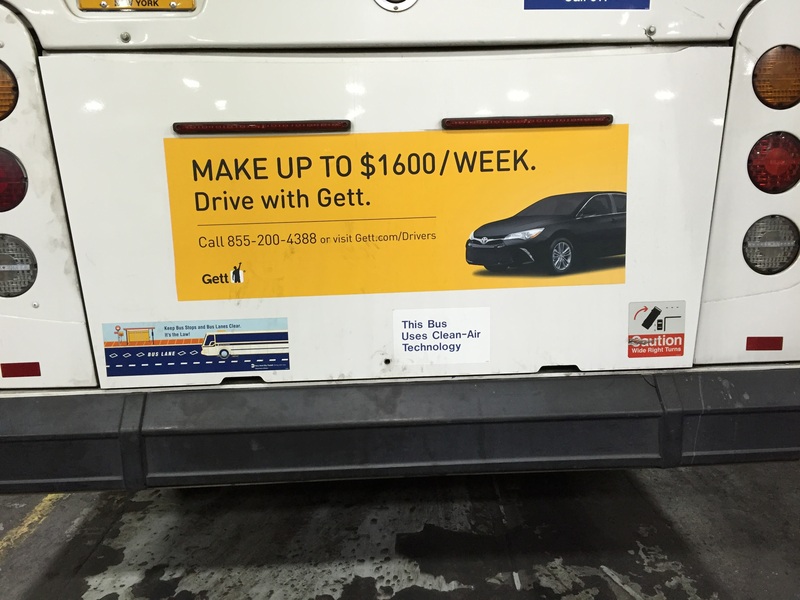 This entry was posted in Oh, Uncategorized on October 30, 2016 by Gary. 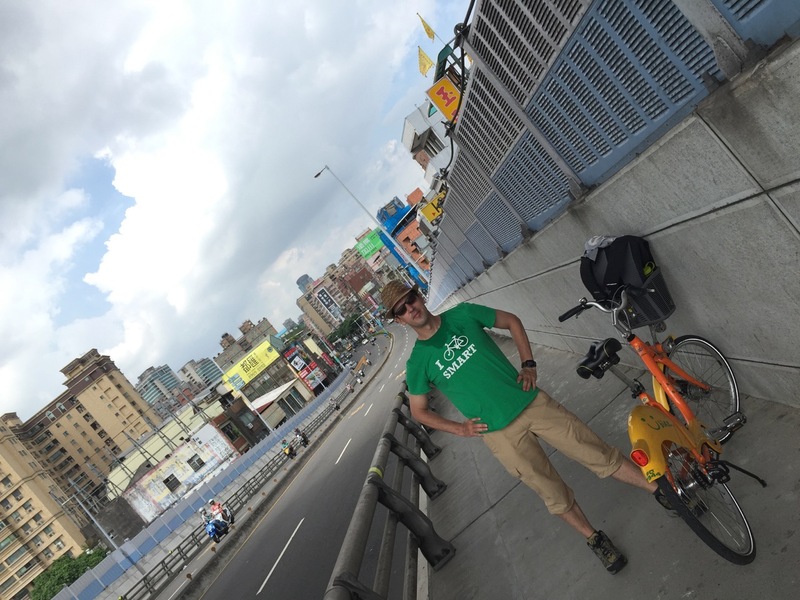 WheeledThing had the pleasure of visiting the island nation of Taiwan. A highlight was a visit to the Giant Bicycle factory, which was arranged with assistance from the Taiwan External Trade Development Council and Taiwan Ministry of Economic Affairs Bureau of Foreign Trade. Go East Young Man, To Taiwan! Have you considered a bicycle centric vacation? Think Taiwan, a democratic island nation with friendly locals, exotic locations, great food, warm weather and amazingly few western visitors. Taiwan is not behind the Great Firewall of China, is about the same size as Maryland with a population similar to Australia. Here is a brief travelogue from a trip to “China with Google” AKA Taiwan, the Republic of China. Oh, it’s also the world capital for bicycles. Now the bad news, Taiwan is far, far away. On China Airlines a nonstop from JFK to Taipei’s Taoyuan Airport takes about 15 hours. When you add in the fact that it’s 12 time zones ahead of NYC, you basically spend a day traveling. On the flip side, you get that day back when you return, as you will touch down only “three hours” after takeoff. Once you collect your bags, Taiwan is pretty easy to get around, in a European sort of way. High speed rail travels the length of the island with speeds over 185 MPH. 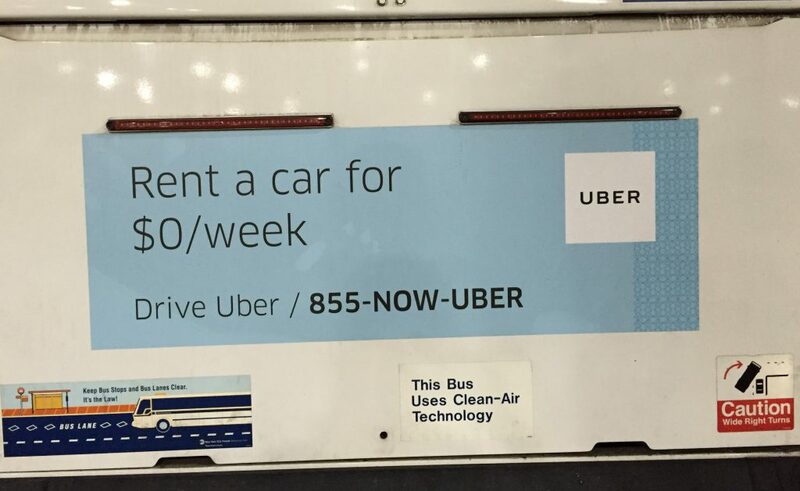 Their extensive rail and bus network can get you almost anywhere. There is also growing network of high quality bicycle lanes and paths. The Taiwan Tourism bureau is promoting a ten day circumferential tour around the island. This ride takes you to both Taiwan’s urbanized west coast and the rugged mountainous east coast. While this may appeal to the “thalon” (marathon, triathlon) people, I prefer avoiding a long distance scenario, especially with luggage strapped to your bike. I rely on public transit between cities and a bicycle within cities. This works well overseas, where unlike the auto centric design in most of America, urban areas are frequently more compact allowing for car free adventures. In Taiwan, the main form of transportation for locals within cities is the motor scooter. Scooters are parked everywhere, on sidewalks, back alleys and crowded near traIn stations. On this island where two wheels reign supreme, we enjoyed a delightful trip on bicycles. Taiwan is more than just friendly to bikes, it is home to the Giant Manufacturing Co, led by their founder King Liu which manufactures over six million bicycles per year for export to the United States and the globe. 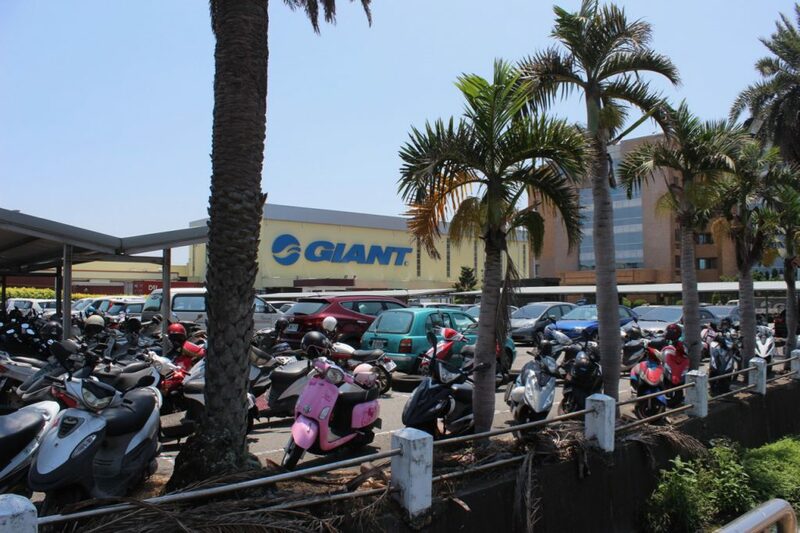 Giant is also the backer of a bike share network,YouBike, which is similar to the CitiBike in NYC and has docks all over Taipei and other cities. The friendly yellow bicycles integrate payments with the EasyCard, which is a national pre-paid tap card which also works on subways, buses and at convenience stores (7-11, FamilyMart…). Important signs are in both Chinese and English, and bilingual locals will come to your aid when necessary. 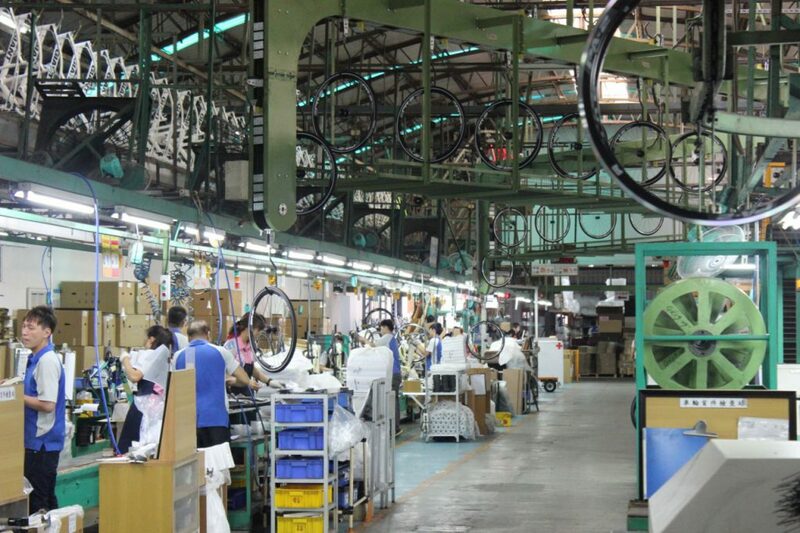 Giant provided a tour of their manufacturing facility in Taichung, which was fascinating, as the bikes are built almost completely by hand. 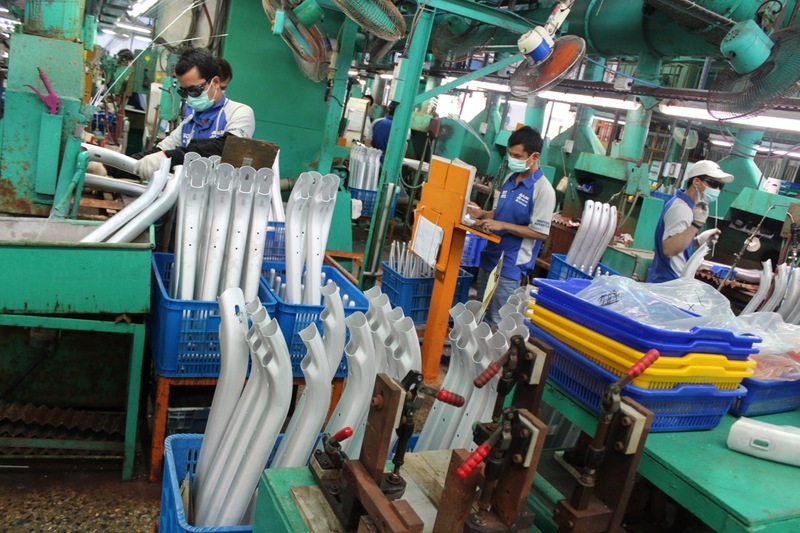 In come aluminum rods, which are heated, stamped, welded, painted and decals are applied. Wheels are manually assembled by connecting spokes to metal rIms and hubs. The last step on the production line is the Giant bike box with the name and address of the bike shop where it will be sold. From this facility they produce about 5,000 bikes per day. This tour was a highlight of an amazing trip to an East Asian island nation. The next time you want a warm island destination, broaden your search away from the easily accessible Caribbean nations packed with New Yorkers. Consider Taiwan which will show you both a good time and also modern amenities that make urban living attractive. This entry was posted in A fine use of wheels on October 22, 2016 by Gary. This entry was posted in Crowdsourced, I liked it better the old way, Not quite a bicycle, Oh, What could possibly go wrong?, Wheelmen Aroused on October 11, 2016 by Kim.